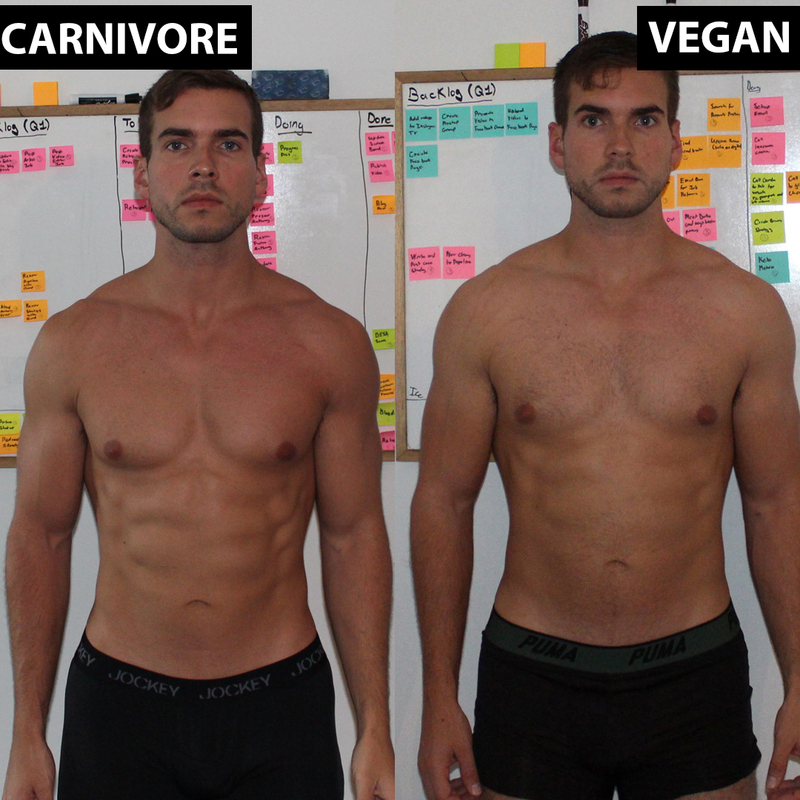 I just finished three weeks of a carnivore diet followed by three weeks of a vegan diet. Before getting started, I measured my strength, body composition, productivity, and other variables to get an objective portrayal of how each diet affected me. As you might guess, the majority of the results differed quite significantly from one another but the area where they were most similar in my overall strength. I measured my strength by calculating my combined one rep max from three different exercises — squats, bench press, and barbell rows — before and after completing each diet. On the carnivore diet my one rep max increased by two pounds, and on the vegan diet, it dropped by 12. 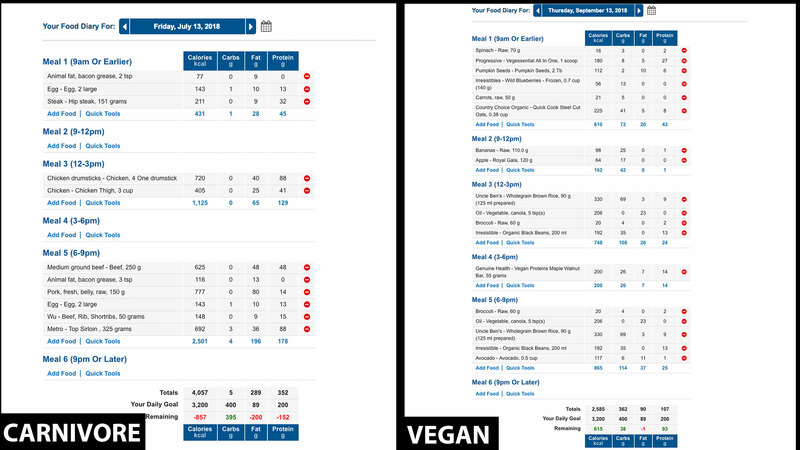 However, I started the vegan diet nearly a month after completing the carnivore diet, and at the end of three weeks of eating vegan, my combined one rep max was still 19 lbs higher than it was following a carnivore diet. 19 lbs may sound substantial but when considered the totals, 889 lbs for carnivore and 908 for vegan. This 19 lb difference represents only a 2.1% difference between the two. This similarity in strength makes sense considering that I had a similar amount of lean body mass at the end of each diet, but the difference in fat mass is where the differences begin to emerge. At the end of a carnivore diet, I had 171.2 lbs of lean mass and 15.9 lbs of fat mass with a body fat percentage of 8.5%. At the end of a vegan diet, I had 172.6 lbs of lean mass and 23.4 lbs of fat mass. You might think that this increase in fat mass came from consuming more calories while on a vegan diet but the opposite is true. On a carnivore diet, I averaged around 4000 calories a day while on a vegan diet I averaged about 2600. This increase in calorie consumption came at a cost. On a vegan diet, I could feed myself for $3 or less per day while on a carnivore diet it cost at least five times that much. Fortunately, it took significantly less time to cook and prepare meals on a carnivore diet since the most complicated a recipe gets is adding salt to a steak. Another thing that required less time while eating a carnivore diet was my sleep. While following a vegan diet, or any other diet for that matter, I would naturally wake up after about 8.5 hours of sleep. This sleep requirement fell to about 6.5 hours when following a carnivore diet. I don’t know what exactly caused this drop, but I do know that these extra hours along with the reduced cooking time could partially explain why my productivity was over 30% higher on a carnivore diet. I track my productivity through the number of tasks I can get done in a three-week time frame, also known as a sprint. At the beginning of every three-week sprint, I create a list of everything that I want to get done and assign scores to these tasks based on their time, complexity, and value. At the end of the sprint, I count the total score that I achieved and use this to measure my productivity. On a carnivore diet, I completed 138 points while on a vegan diet I completed 93. Another reason that might explain this drop in productivity is the mental effort required to stick with each diet. A carnivore diet certainly takes more discipline to sustain. The food options are extremely limited, and the recipes consist of no more than meat and salt. These severe restrictions nearly eliminate all the mental exertion on deciding what you will eat, how you will cook it, and where and when you will shop for these ingredients. These may sound like trivial decisions, but there is a tremendous amount of research that shows there is a limited amount of choices we can effectively make in any given day. This decision fatigue is why entrepreneurs like Mark Zuckerberg and Steve Jobs wear the same clothes every single day. Eliminating that simple choice leaves a higher capacity decision making for productivity and choosing meals requires significantly more effort than selecting an outfit. I thought that an increase in testosterone might have have been an accomplice in my productivity boost, but again the opposite of my intuition was true. 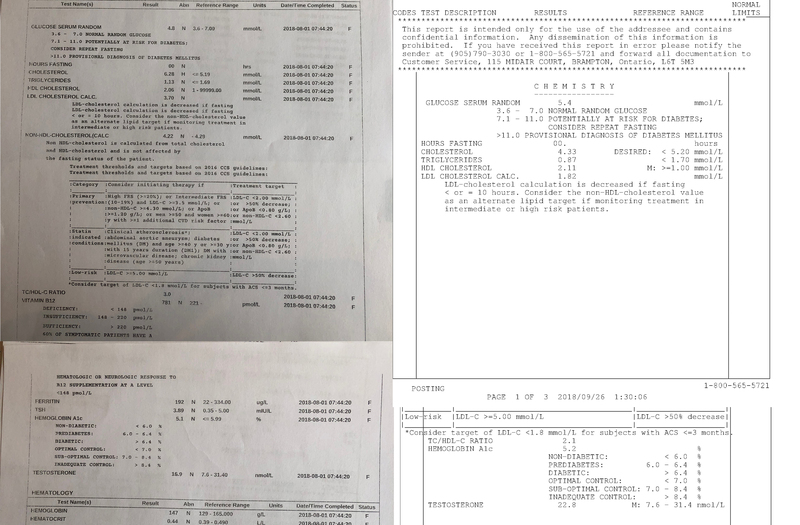 At the end of a carnivore diet, my testosterone fell 22.5% from 21.8 nmol/L to 16.9 nmol/L. At the end of a vegan diet, this number increased by 34.9% to 22.8 nmol/L. Even more concerning than this drop to my testosterone was a spike in my LDL cholesterol. My LDL cholesterol rose from 2.68 mmol/L to 3.7 mmol/L on a carnivore diet before dropping to 1.82 mmol/L on a vegan diet. This cholesterol decrease was so dramatic that my doctor had to call me aside and ask how I did it. He said that if he prescribes a patient medication the best results that he could hope for is a 10% reduction. When switching from carnivore to vegan, my cholesterol fell over 50%. The final thing to touch on is the ethical consequences of each diet. If you have ever seen the conditions of factory farms, then it is pretty hard to deny that a vegan diet is morally superior. Typically, I spend none of my time considering the ethical consequences of what I am eating; one of the benefits of remaining blissfully ignorant about the abhorrent environments in which many animals live. However, even after switching to a vegan diet and learning more about the conditions of these farms I still never thought about the ethical consequences of what I was eating. I never felt better about myself for not eating animals. In fact, I didn’t even think about it until writing about my results. That isn’t to say that you shouldn’t try to make these ethical choices, it is to say that those choices alone are unlikely to improve your personal quality of life. I still applaud people for making these ethical choices as long as they do not become militant in their ideology. Before beginning these diets, I assumed that a carnivore diet would be more useful for achieving my goals. With the evidence in, it’s hard to deny that the vegan diet had some significant advantages. My blood results were superior while following a vegan diet and my bank account was content with my decision. The carnivore diet was better for reducing body fat and increasing productivity, but with the increase in cholesterol and drop in testosterone, it’s difficult to recommend it outright. So my suggestion would be this; if your primary concerns are animal welfare or blood cholesterol, then a vegan diet is undeniably superior. If your primary concerns are lowering body fat and increasing your productivity, then a carnivore diet is better for you. For now, I am not going to stick with either as I believe there is room for both diets to be improved. Immediately following the conclusion of a vegan diet, I began a low-carb, ketogenic diet. I want to know if this can help me retain the improvements in productivity and body composition that I received from the carnivore diet while eliminating the negative blood results. If you want to see how this diet compares then follow along and I will keep you updated.